How can we support, activate and unleash technologists to use their gifts to advance God’s Kingdom? In this talk I share the massive opportunity for the Church (especially in the Pacific Northwest)–so massive it would be irresponsible not to pursue–as well as 4 methods and 6 models for doing so. This talk was delivered at the Christ and Cascadia 2016 conference. A recording, manuscript and slides are below. Good morning, my name is Chris Lim, and I’m Founder and CEO of TheoTech. 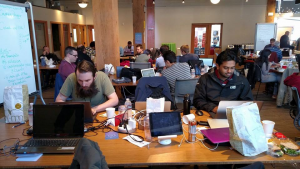 Today I’m going to share some thoughts on Faith and the Cascadian Tech Sector. Whether you are a pastor, a business person, a technologist, or simply a follower of Jesus, my aim is to inspire you with what God could do in our local technology industry to advance his Kingdom. I want to show you examples of what has already been happening and how you can get involved in advancing God’s Kingdom with technology. There are 238,900 workers in the Washington tech sector spread across more than 8600 companies. 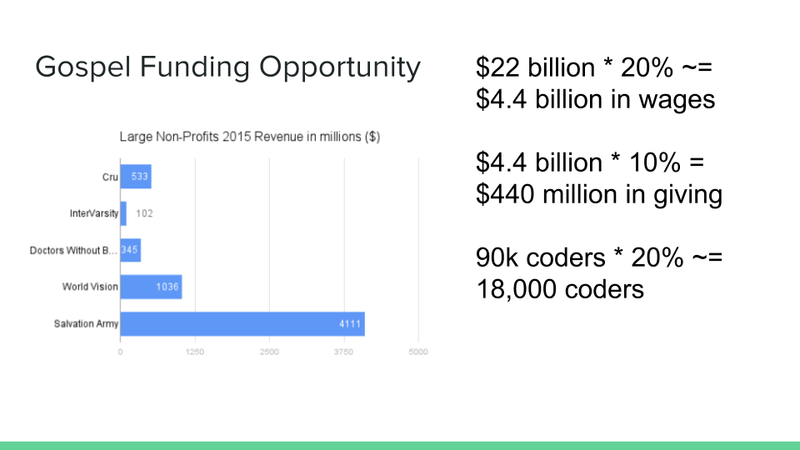 Of these, about 90,000 are coders and each coder generates 7 additional jobs. In 2013, the industry paid $22 billion in wages contributing more than $2 billion in taxes. 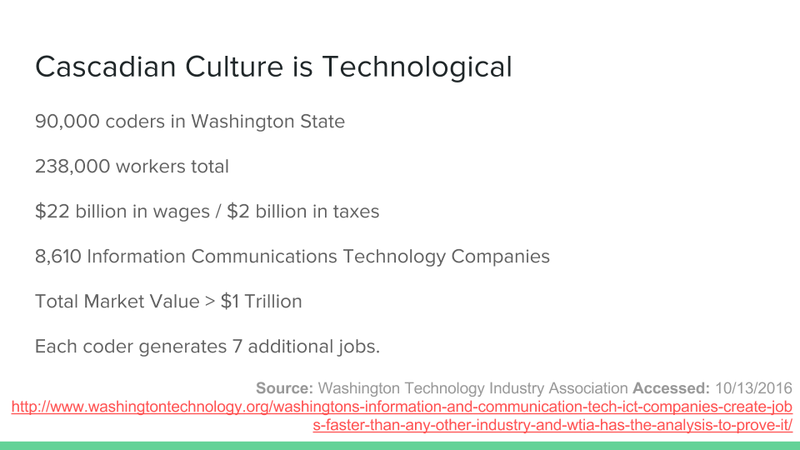 The total market value of the Washington state technology industry exceeds $1 trillion dollars. That’s some pretty heady stuff. Globally renowned companies like Boeing, Microsoft and Amazon have infused Cascadia with a tech culture and their outsized impact means that whether we like it or not Cascadian values and cultural exports have significant influence around the world. So point number 1: the Tech Sector is hugely important. I cross referenced these statistics with the Pew Forum’s religion research for Washington in 2014. 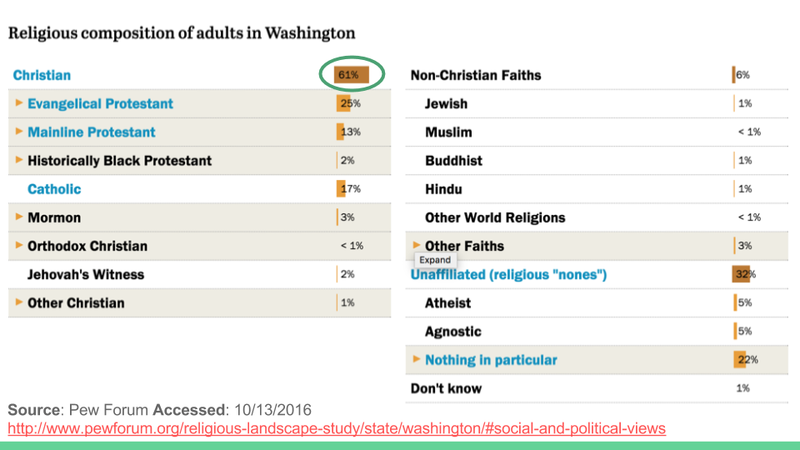 I was surprised to learn that about 60% of Washingtonians identify as Christian. 32% identify as religious “nones”. Now if you’ve been in the tech sector for awhile, you probably feel like these statistics should be reversed. At first you might feel lonely. You may be the only follower of Jesus on your team at work. In a company of 25,000 maybe only 10 people show up to a weekly prayer gathering. In an industry full of extremely intelligent and successful people who largely think they don’t need faith or Jesus, you may feel like simply minding your own business and keeping quiet about the Kingdom of God. But I think you’d be mistaken to do so. God has placed you in this powerful industry for a reason and gifted you with technological acumen so that you can bear witness to his Kingdom. Don’t be afraid, you are not alone. God is with you. In fact, in many ways, I think He is presenting you with an enormous Blue Ocean opportunity. Instead of 60%, let’s assume 20% of the Washington tech industry identifies as Christian. That would mean 18,000 coders who claim allegiance to Jesus Christ. Wow, 18,000? What could God do with 18,000 coders? I’m going to share some ideas shortly, but let’s briefly consider the financial power of the industry. Assuming the 20% ratio holds, we would expect Christians to earn about 20% of $22 billion or $4.4 billion. If they allocated 10% of those wages to funding work that explicitly advances God’s Kingdom, there would be about $440 million in annual revenue available to make disciples of all nations. To give you some perspective, $440 million is comparable to all of Cru, formerly known as Campus Crusade for Christ, and it is larger than InterVarsity. It is about half of World Vision’s annual revenue. 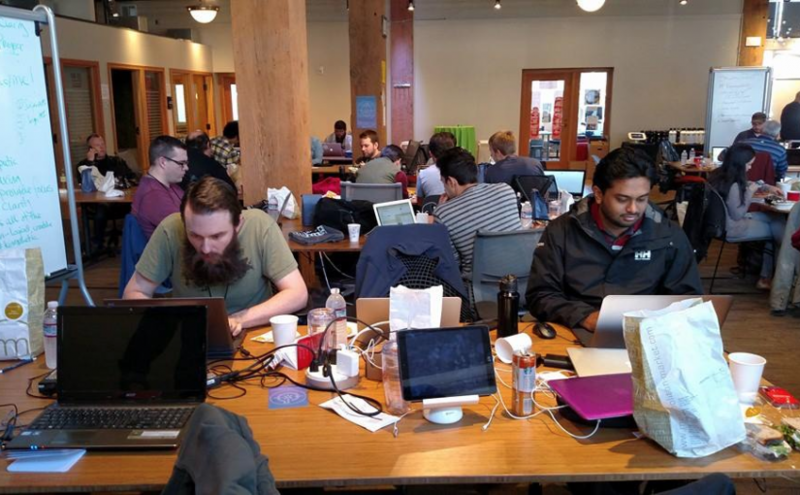 This global work could be supported by the giving of the tech sector of just Washington state. I believe many Cascadians are already very generous, but imagine what could happen if we saw this kind of generosity coming from the tech sector? What would be possible if more than 20% of the tech industry became followers of Jesus? I did the math with these assumptions and every time someone in the technology industry becomes a follower of Jesus and invests 10% of their wages explicitly in the Kingdom of God, the Kingdom gains almost $10,000 in free cash flow annually. So one hundred new tech disciples unlock $1 million of free cash flow for the Kingdom of God. Now like any other technologist, I don’t like being viewed as simply a dollar sign for this or that cause. But I wanted to call out the immense influence of the Cascadian technology sector and with it the immense responsibility of the Cascadian Church to make disciples of people in the industry. For I do not mean that others should be eased and you burdened, but that as a matter of fairness your abundance at the present time should supply their need, so that their abundance may supply your need, that there may be fairness. Now, I think this generosity goes far deeper than money. God has entrusted technologists with gifts and skills and wisdom that, like the craftsman who constructed the Tabernacle, can be explicitly applied to advancing God’s Kingdom. And I think the Cascadian Church must support these software craftsman in using those skills to create foretastes of the Kingdom. First, theological instruction, second kingdom witness, third technological activation, fourth eschatological entrepreneurship. Let’s briefly survey all four and give special attention to number 3. So number one, Theological Instruction. When John the Baptist and Jesus started proclaiming the Gospel, they said, “The Kingdom of God is at hand. Repent and believe the Gospel.” John in particular was approached by tax collectors and soldiers asking what it meant for them to repent and he said, they should collect no more than owed and to stop abusing their power to extort money. In our present day we often speak of how business and the marketplace advance the common good. This is good. People need to understand intimately how their work reflects and advances God’s Kingdom and they need to be instructed and helped in the process of discovering how their vocation explicitly glorifies Jesus Christ. It doesn’t happen automatically, so we must preach and teach life in the Kingdom of God. We must proclaim God’s vision and show the correspondence between present reality and the trajectory of history with the prophetic word. Then by breaking it down into the nitty gritty details of daily work from code reviews, debugging, performance reviews, human-centered design, artificial intelligence and everything else we equip and release believers to use their gifts to advance the Gospel of the Kingdom in every sphere of life. Theological instruction is therefore intimately connected to Kingdom Witness. Not everything in the tech sector is good and not everything is bad. By thinking deeply about Scripture and being led by the Spirit in the royal law of love, Christians have a special discernment about what can be affirmed in the industry and what must be corrected. With boldness we must speak up for what is pleasing to God in technology and call for repentance in the areas that are contrary to God’s design. And the interesting thing is that much of the industry is open to listening. You might find that surprising, but I want to call out some recent things that have been coming out of the industry with respect to artificial intelligence. With one voice, all industry leaders from Bill Gates to Jeff Bezos believe AI is going to disrupt and reshape society. On the one hand, it has great potential to make our lives healthier, more convenient and connected. But it also has great potential to cause massive job loss, it poses ethical dilemmas in cases like accidents between self driving cars and it brings up deeply spiritual questions about the nature of intelligence, consciousness, and what it means to be human. Recently industry giants like Amazon, Microsoft, Facebook and Google formed a “Partnership on AI to benefit people and society”. 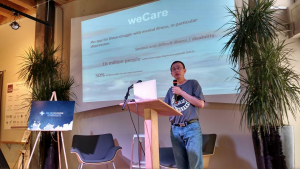 They want it to be an open platform for engaging the public about AI and society, which means that it is an ideal forum to bear witness about God’s Kingdom as the industry navigates really difficult questions about AI and the ways technology can be used to benefit humanity instead of destroying it. Now I’d like to dive into the third way the Cascadian Church can unleash coders for the Kingdom: Technological Activation. As I mentioned earlier, if 20% of the tech industry were disciples of Jesus Christ, we would have about 18,000 coders who have been gifted by God for an amazing purpose. The Church must help these believers to use their gifts to advance the Gospel, not simply invite them into cookie cutter volunteer roles. There will always be a place for serving as an elder, volunteering on a weekend or leading a Bible study, but these believers have the capacity for so much more. 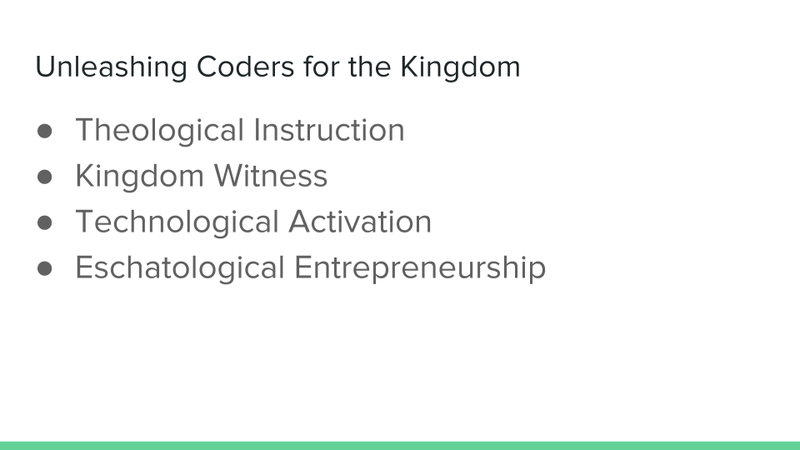 So here are 6 models for activating technologists to use their gifts to advance the Kingdom. The first model is a hackathon. It’s basically 48-hours where like-minded people collaborate to create solutions to Kingdom challenges, particularly with tech. You don’t have to be a coder to participate–applying and adopting technology for the Kingdom is as important as creating it. But a hackathon is a place for do-ers. People who want to get their feet wet with new technology, people who want to use their skills and do something about the challenges they see in the world from a Christian perspective. Do you know people like that? Are you one of them? So let me walk through an example from last year’s Code for the Kingdom Hackathon. First we start with prayer, an introduction and then an open mic. Anyone, and I mean anyone, who has an idea can get in line and share it with the room for 2 minutes. Then each person with an idea gets a sign and everybody mingles to chat and decide which team they want to join. Once everybody has a team, it’s time to get to work. Some people pull an all-nighter, others take a nap–either way, it’s lots of food and lots of fun. On the last day of the event every team has the opportunity to pitch their project to a panel of judges. These judges and the people get to vote on the project they want to award and those projects compete at the global level to get further support, momentum and distribution. So after nearly 48 hours, we celebrate God’s grace over the weekend and go home and sleep. So the hackathon model is very flexible and a great way to get people started using their gifts for the gospel and getting connected to and inspired by other like-minded people. It’s something that your church can do–all you need to do is provide the space, the time, the food and a program. It doesn’t have to be 48 hours, it doesn’t have to be a big production. Again, at the heart of it is activating people to use their gifts for the Gospel by bringing them together for a period of focused and intense, but fun collaboration. 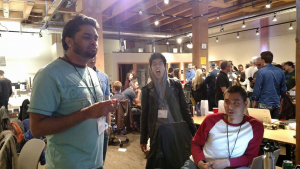 You’re all invited to this year’s Code for the Kingdom Seattle hackathon. It is going to be next weekend from Friday to Sunday at Seattle Pacific University. Here are some links where you can register and learn more. Come and see for yourself what it’s like and please share it with other do-ers! Since my time is almost up, I want to briefly touch on the other 5 models of engagement. One is the Bezalel Open Source Model. Open Source means that the intellectual property behind the software you produce is licensed in a way that enables other people to read and contribute to the source code. How many of you use Linux? Linux is so ubiquitous, powerful and flexible because it is open source. Developers from all over the world can contribute to the code base and use it for their own purposes. In the case of Linux, it’s original creator Linus Torvalds is known as the BDFL or “Benevolent dictator for life” because he has the final say in whether or not to accept people’s code contributions to the Linux kernel. In some ways he is like Bezalel the master craftsman overseeing the construction of the Tabernacle to fulfill Moses’ specifications. That is why I call it the Bezalel Open Source Model. 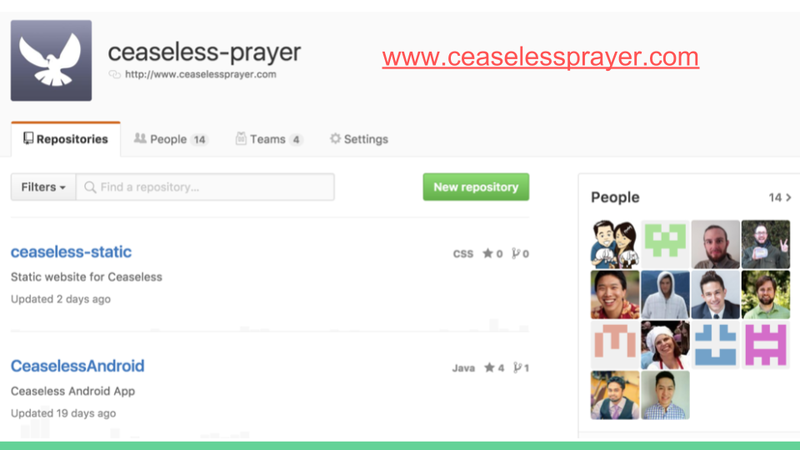 At my company we’ve open sourced Ceaseless, an app that helps you pray for others. The advantage of making the app open source is that other people can contribute to making it better and more suitable for their use cases. They don’t have to work for your company or organization, yet if they find the app useful and want to make it better, they can be a part of improving it. You can see here that Ceaseless has a team of 14 people who are largely volunteers, contributing to the app. So this is a way beyond hackathons that people can continue using their technological gifts on explicitly Kingdom-oriented software projects over time. Again, if you’d like to try out the app, you can download it at ceaselessprayer.com or if you’d like to contribute to the code you can check it out by searching for ceaseless-prayer on GitHub. Model number 3 for technological activation is missional communities in corporations. There are believers in companies like Microsoft and Amazon who gather for regular prayer and the word. When I was an engineer at Amazon, I convened a group of believers to study the Theology of Technology because as creators of technology we have a great opportunity and responsibility to infuse what we build with the values of God’s Kingdom. This was consistently a refreshing time, not only to think about the Kingdom of God, but also to encourage one another in the daily struggles of work. God uses groups like this to make disciples in place–making disciples directly in the marketplace and at work. If you are a pastor interested in serving the tech community, I’d love to speak with you about the need for corporate chaplaincy. 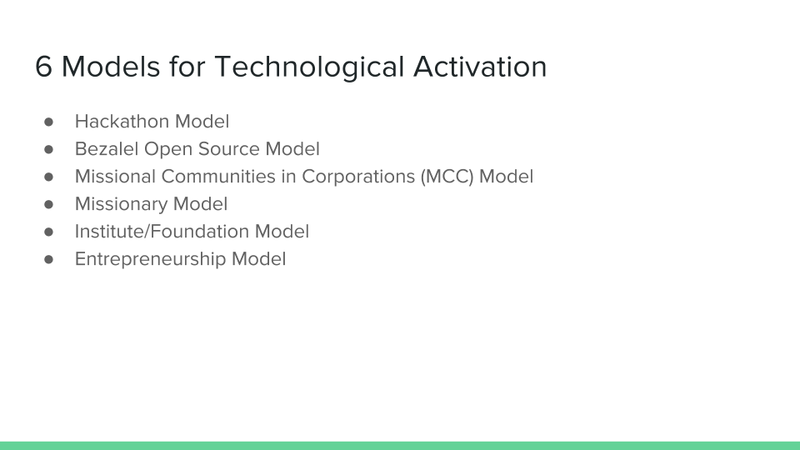 Model number 4 is the Missions model, or non-profits that create technology platforms that others can build on. One example of this is the Digital Bible Platform from the ministry Faith Comes by Hearing. 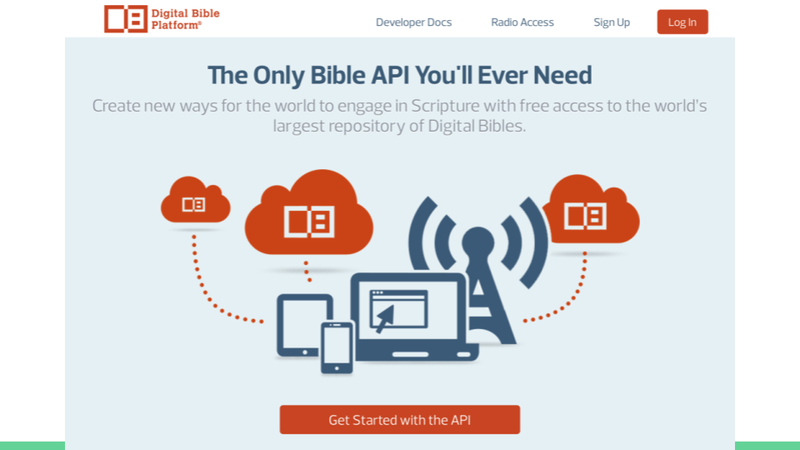 By making their Bible content available through an API, developers can easily integrate Bible content in their apps. Ceaseless for example uses the Digital Bible Platform to show a Scripture related to prayer each day as a devotional aid. So if your church or non-profit has certain kinds of data that it can export via an API, creating a platform is a way to engage and activate technologists to build things that will advance your mission. Model number 5 is the institute or foundation model and this is related to the missions model, except that it is more explicitly focused on technology. How many of you are familiar with the browser Firefox? Did you know that it is created by the Mozilla foundation, which believes that, “the Internet must always remain a global public resource that is open and accessible to all”. I mention them because I think there is similarly a need for a Christian software foundation which can steward the software generated by many developers to address Kingdom challenges so that the projects and its impact can outlast the individuals who started them. And so we close with Model 6, Entrepreneurship or as I like to call it Eschatological Entrepreneurship: Spirit-filled leaders fully exercising their gifts everywhere and together to hastening the coming of Christ. One local example of this is a startup led by my friend Jonathan Kumar. 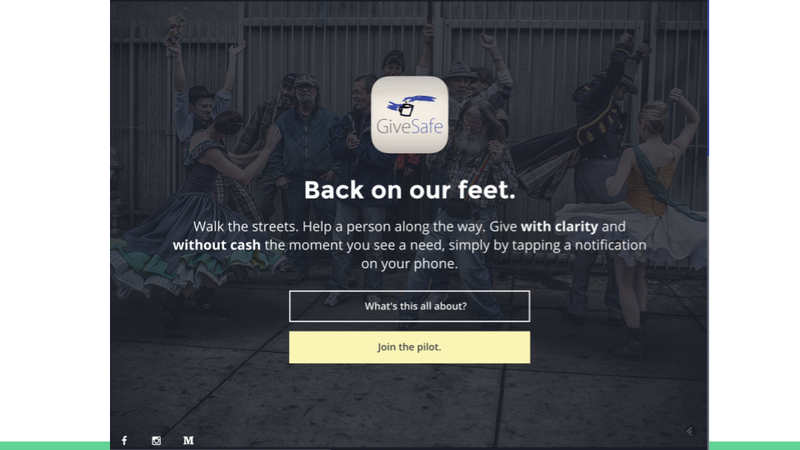 His company, GiveSafe helps people be the hands and feet of Christ when they see someone in need. Basically their company partners with non-profits to distribute bluetooth beacons to people experiencing homelessness. Then if you have their app installed on your phone, you’ll get a notification when you are near a beacon. From that notification, you can read the person’s story and give money to help with their needs. The money goes to an account they can use to get goods and services from non-profits and vendors, so that you can give without worrying about the money being used for a negative purpose. A second example is my company TheoTech and our product SPF.IO. 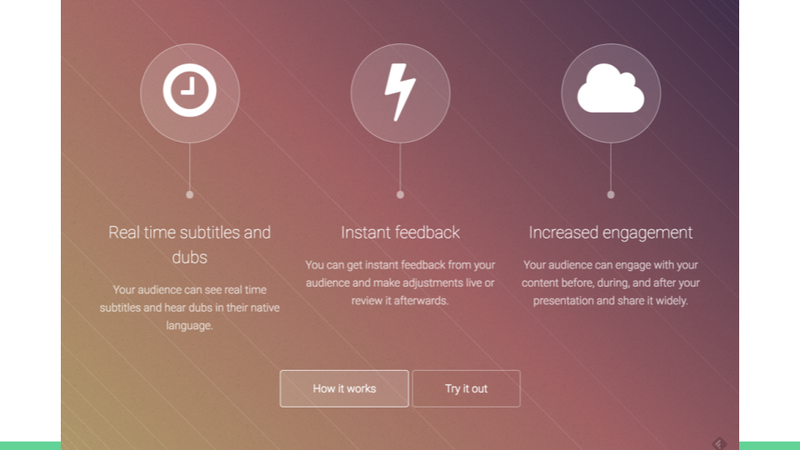 It’s a product that lets you speak freely in your language while providing subtitles in real time on people’s smartphones for those who are hard of hearing or do not speak your language. The Kingdom purpose of this product is to empower churches to reflect the multilingual glory of God’s Kingdom. Churches should be a foretaste of heaven and SPF.IO is meant to help make that possible. The common good purpose of this product is to help minorities have access to the same experiences and services that English-speakers have. Talk with me afterwards if you’d like to use it in your church or organization. For the long term, I believe that paying people market rate for using their technological gifts to advance God’s Kingdom requires prosperous for-profit companies that have business objectives explicitly aligned to Kingdom objectives. That is one reason why I created TheoTech and why I believe Model 6 is an essential component for long-term activation of technologists for the Kingdom. So there you have it. 6 ways the Cascadian Church take advantage of this amazing opportunity to accelerate the Gospel and make disciples of all nations through technologists and technology. I realize we covered a lot of ground today and so I want to leave you with one simple call to action as a next step. 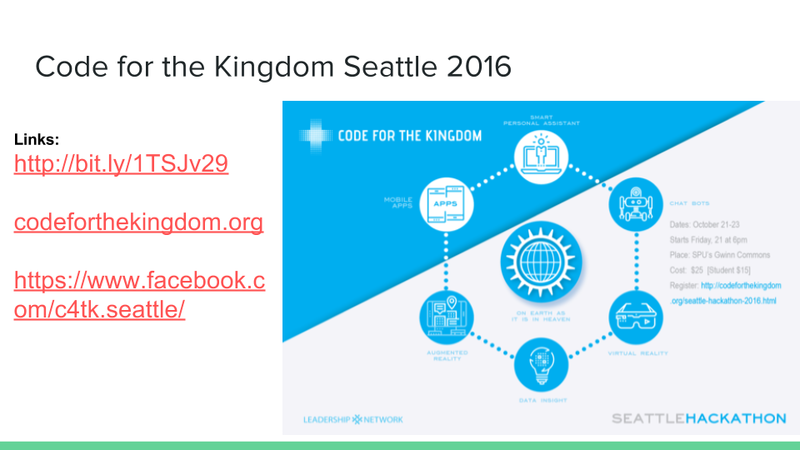 Come to Code for the Kingdom Seattle next week. See for yourself what God is doing about Faith and the Tech Sector.